THOUGHTSKOTO Thoughtskoto : Have plans to travel in the USA? Prepare your social media password! Have plans to travel in the USA? Prepare your social media password! Do you plan to travel or work in the USA? 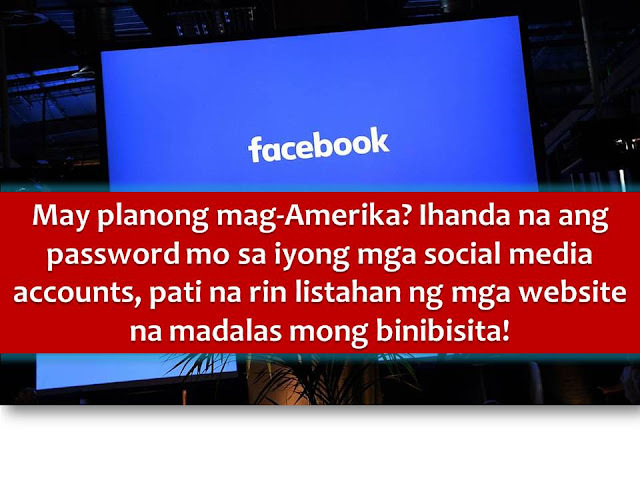 If yes, be ready and prepare your social media password like in Facebook. Not only this, because they also could ask what websites you visit. The US embassy could ask for this details when applying for US visa. Homeland Security Secretary John Kelly said this will be for future background checks in an effort to toughen critical examination of visitors. This will also screen people who could pose a security threat. Asking social media password is one of the things that is being considered for visitors especially coming from Iran, Iraq, Libya, Somalia, Sudan, Syria, and Yemen -- the seven Muslim-majority countries earlier being banned to the US. "We're looking at some enhanced or some additional screening," Kelly told a hearing of the House Homeland Security Committee. "We may want to get on their social media, with passwords," he said. As of this moment, Kelly said there is no decision had been made but tighter screening will be implemented in the future, even if it means longer delays for awarding US visas to visitors.